Toxic Tau Of Alzheimer's May Offer A Path To Treatment : Shots - Health News Faulty forms of the brain protein tau trigger tangles inside and outside brain cells of Alzheimer's patients. Scientists say figuring out how to stop bad tau's spread from cell to cell might be key. 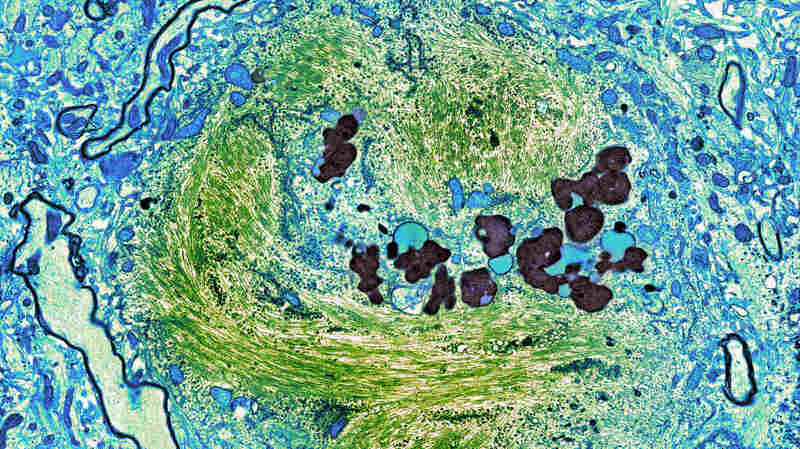 A tangle of protein (green) in this scanning electron micrograph of a brain cell of an Alzheimer's patient lies within the cytoplasm (blue) of the cell. The tangle consists of clumps of a toxic form of tau. After years of setbacks, Alzheimer's researchers are sounding optimistic again. The reason: a brain protein called tau. At this year's Society for Neuroscience meeting in Washington, D.C., there are more than 100 papers on tau, which is responsible for the tangles that form in the brains of people with Alzheimer's. In the past, tau has received less attention than another protein called amyloid beta, which causes the sticky plaques associated with Alzheimer's. "Many people focused on amyloid beta for many years," says Julia Gerson, a graduate student in neuroscience at the University of Texas Medical Branch, who presented a paper on tau at the neuroscience meeting. "Now it's coming out that tau might be more important." If we could figure out how to stop that spread, maybe one could limit the disease to just some brain regions, instead of having it go everywhere. "Clearly both are working together, conspiring if you will, to bring down cell functions and cell survival over the years as the disease unfolds," says Dr. Lennart Mucke, a neurologist who directs the Gladstone Institute of Neurological Disease, a research center affiliated with the University of California, San Francisco. In the past decade, several promising drugs that merely lower amyloid have failed to stop Alzheimer's. Those failures, Mucke says, helped persuade scientists to take a closer look at tau, which has produced some surprising findings. "Initially it was thought that tau was purely inside brain cells," he says. "But now we recognize that it can actually exist outside of cells and even transfer from one cell to the next." The idea that tau can spread from cell to cell like an infection suggests a new way to treat Alzheimer's, Mucke says. "If we could figure out how to stop that spread, maybe one could limit the disease to just some brain regions, instead of having it go everywhere." Some researchers are already trying to interrupt the process, using the immune system to mop up toxic forms of tau. A similar strategy has proved effective for reducing amyloid. The closer look at tau also revealed that the protein comes in different forms. In its most common form, tau actually helps brain cells function, Gerson says. "But in disease, for various reasons that we don't entirely understand yet, it takes on this other, toxic form," she says. This toxic tau, known as a tau oligomer, occurs not only in Alzheimer's patients but also in people with traumatic brain injury. In both groups, Gerson says, the protein appears to build up over time and lead to memory problems. To find out more about this process, Gerson and a team of scientists injected tau oligomers from people with Alzheimer's into the brains of healthy mice. Within a week the mice developed memory problems; tissue samples showed toxic tau throughout the animals' brains. "What we believe is happening is that the toxic form [of tau] induces the healthy form in the brains of these mice to take on that toxic conformation," Gerson says. The new research suggests that treating Alzheimer's will require drugs that affect both tau and amyloid, and perhaps other factors that are less well understood, Mucke says. That means doctors will need a lot of different tools. "The problem," he says, "has been that the toolbox was nearly empty." Thanks to the sort of research presented at this year's neuroscience meeting, Mucke says, that toolbox is starting to fill up again.